Unions such as Unite and PCS have responded positively to an appeal from Health Campaigns Together to health unions, local and national campaigns seeking support for the march. Other unions are due to discuss it. 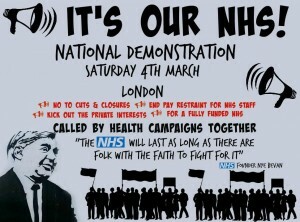 The NSSN calls on all our supporters and affiliates to build for the demonstration and defeat the Tory cuts. In the Summer term, Tobias invited junior doctors to speak to the school’s NUT group. Meetings such as this were encouraged by the NUT to show solidarity for our joint campaign. Tobias was also vocal in his opposition to his school becoming an academy, in line with NUT policy. As part of his opposition he approached parents at the school to discuss the academy conversion.